Are you ready to take your Mustang Shelby GT500 to the next level in performance and sound? 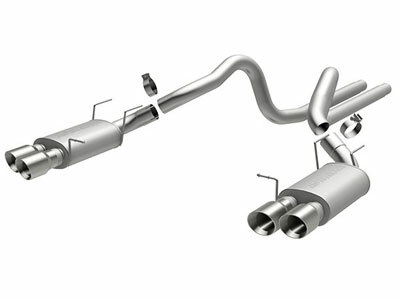 Magnaflow has developed this Cat-Back Street Series exhaust to give you some more ponies and that deep intoxicating Mustang sound. The Street Series is designed for the GT500 daily driver giving you an aggressive exhaust note while avoiding drone and being too over bearing. Made out of 100% high grade stainless steel for durability and maintaining factory mounting points this exhaust is the perfect next mod for you. Get your Magnaflow Street Series Exhaust today before they run out of stock.